(Bloomberg) -- Peugeot parent PSA Group’s Vauxhall arm will offer an electric version of the Vivaro van, potentially helping to safeguard the brand’s Luton factory amid a wave of cost-cutting and uncertainty around Brexit. 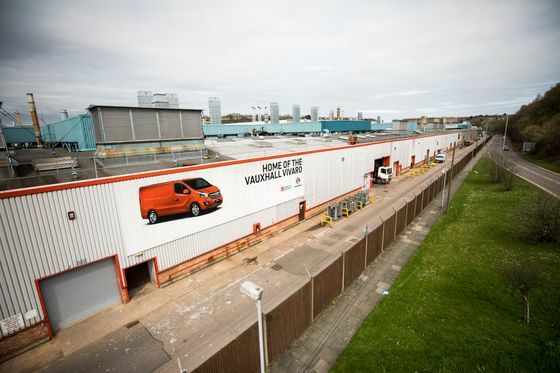 Vauxhall will sell the battery-powered Vivaro from 2020, it said Wednesday after confirming that an upgraded version of the standard diesel van will be built at the plant north of London. That move will protect 1,250 jobs and increase the site’s capacity to 100,000 vehicles a year, “heralding a bright future,” it said. PSA said in 2018 that Vauxhall would build an update of the Vivaro, which was developed under ex-owner General Motors Co. Getting an electric version would help future-proof Luton as PSA pares products and headcount after buying Vauxhall and sibling Opel in 2017. The van could alternatively be built elsewhere and badged as a Vauxhall, according to a spokesman. Opel-Vauxhall will also take over development of European vans for the whole of PSA, which includes Peugeot and Citroen. The operation will be based at Opel’s Rüsselsheim facility, near Frankfurt. Production of diesel Vivaros begins this summer and may add jobs at Luton, Unite Union national officer Des Quinn told Bloomberg. Contract changes to boost competitiveness show some Britons are giving ground to save posts as the split from Europe looms. Vauxhall’s biggest plant, the Astra car factory at Ellesmere Port near Liverpool, awaits a decision next year on where to build a revamped model. PSA has been mulling whether to shut one of the U.K. sites, which employ 3,000 people, a person familiar with the plan has said. PSA shares traded 1.1 percent lower as of 3:24 p.m. in Paris. They’ve gained 13 percent his year after advancing 10 percent in 2018, aided by a return to profit at Opel-Vauxhall. Click here to see the Vauxhall statement.